Do you want to lose weight, but do not know where to start? Well then, try newest Beachbody fitness program “21 Day Fix”. Why? Because it is a perfect blend of nutrition and fitness that will bring you Fast Results! What is 21 Day Fix Program? 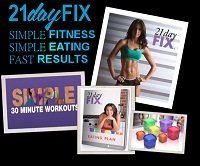 The 21 Day Fix reviews indicate that the program uses unique portion-control system combined with easy-to-follow 7 different high intensity workouts. This 21-day routine so simple, that anyone can jump up their fitness level and get incredible results in no time at all. No complex cardio routines, heavy weights, or confusing calorie charts are included in the program that makes it harder to manage fitness. You will be following a controlled-eating system combined with 30-minute workout schedule, to get in shape – fast! How will Autumn Help you in 21 Days? If all you wanted, was a routine that does not include intense physical training and just focuses on mending your health by taking care of your dietary habits, then 21 Day Fix is your answer! You will be dividing your meal selections based on color and size of the containers that comes with your program kit. With this measurement technique, forget all about counting calories and making workout charts that used to make fitness so complex. Just sit down to eat the right foods in right quantities. 21 Day Fix workout is doable for all fitness levels. It follows plyometrics training technique to offer you best results. All the seven workouts are 30 minutes each, 7 days a week for 21 days. Test groups have lost an average of 15 lbs during each cycle. In just three weeks, you will lose 10 – 15 pounds, if you stick with the plan. Hats off to Autumn Calabrese for bringing 21-Day Fix – Amazing, isn’t it? Order Your 21 Day Fix Fitness Program Today! Where to Order 21 Day Fix? Carl Daikeler announced on his Facebook page “In its first eight hours, 21 Day Fix sold more than we projected… FOR THE WEEK”. Even Challenge pack is sold out now. Hurry up and pre-order the 21 Day Fix Challenge Pack, 21 Day Fix Base Kit, and 21 Day Fix Ultimate Kit on TeamBeachbody.com.